Dutch black metal isn’t something that you hear about a lot, but it does have its gems – not least the incredible Urfaust. This duo’s distinct take on the genre is fascinating, not least for the vocals, which depart from the typical shrieks and howls in favour of what is a demented form of Gregorian chanting, very, very wrong and disturbing. The opening track Vom Gesicht und Rätsel is a perfect example. Vocalist (and guitarist and keyboardist) IX sounds utterly insane, a mad monk directing a symphony of the night, utterly in keeping with the traditional black metal atmosphere despite the music being far from the stereotypical icy blizzard. It’s a melodic mixture of ‘medieval’ black metal with doom and ambience, a distinctly audible bass providing wonderful backing. 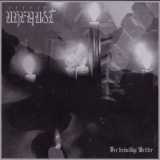 Urfaust write in German, and there’s a definite folky tint to the carefully constructed melodies that arise almost ritually from the music, focused on in an incredibly effective synth interlude and then pushed back as IX returns, howling his occult prayers. The entire album can be summed up as a varied and compelling ritual, easily imaginable as the soundtrack to a ceremony held at night, lit by fire and fuelled by fear. After aforementioned memorable opener Vom Gesicht und Rätsel, the following title track is virtually drone in comparison, the ritual slowed and intensified, the chants slowly and less energised, ending with a distant and muffled piano. The chants become shrieks on Das Kind mit dem Spiegel, a slow and simple keyboard melody making the track seem like some long lost Burzum anthem. Despite the vocal departure it works well as a kind of punctuation mark in the album, the following Der Mensch die kleine Narrenwelt continuing the post-Burzum feel with a deep, crawling riff creating a particularly Sunn O)))-ic soundscape before the chanting resumes. As much as IX holds your attention, I have to mention VRDRBR’s drumming, which doesn’t blast, but weaves a strangely hypnotic web, just as ritualistic in its almost tribal backing. Even when at a snail’s pace, as on the demonically majestic Der hässlichste Mensch, it’s impossible to relegate as mere background noise, but commands attention and accentuates the pounding doom of the song. Finale Der Zauberer, in conclusion, is especially creaky and decrepit at first before IX launches into his most powerful performance, adding a touch of epic grandeur and returning to his shrieks as the ritual comes to an end. As a whole, the album isn’t quite perfect – the up-tempo Ein leeres Zauberspiel is good but feels rather out of place, as if the ritual was interrupted for a hoedown. Yet even so, Der freiwillige Bettler is a gripping and original take on black metal that will tease and delight those in search of something different.